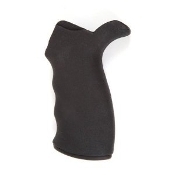 The Ergo model 4011 is an ambidextrous grip kit for AR15/M16 & AR-10 rifles. Unified in the mission to provide military, law enforcement, citizens and shooters with the finest mission enhancing firearms accessories available, the people of ERGO have grown their business through a combination of precision manufacturing and exemplary customer service. All ERGO products are 100% manufactured in the USA to the highest standards and the tightest possible tolerances. Expanding far beyond industry standards, every ERGO product is backed by a comprehensive satisfaction guarantee. This item replaced the 4005-BK ambi suregrip. Over molded SUREGRIP material with original texture.